Been a short while since the new year festivities so without any further delays, we bring all of you this new images from the upcoming 2017 V-Cinema presentation, Space Sheriff Gavan VS Special Investigation Task Force Dekaranger movie! 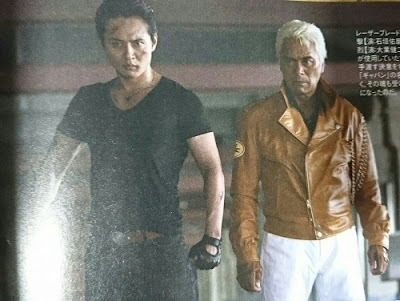 As we can see from the first image, the Dekarangers (in their SWAT modes) and Gavan Type G are preparing for some hard hitting action. As for the second image, we have Geki and Retsu aching for some double Jouchaku! And lastly we have, the space police girls on the last image preparing to face the revived Hellvira in their own movie, Girls in Trouble! It's sad how they'll re-release the Gavan SHFs but won't use this as the PERFECT (and at this point ONLY) opportunity to release those Deka SWAT SHFs they made prototypes of years ago. i think it's great to see a sentai team reunion movie that isnt just a straight to dvd 10 year release. if there are stories to be told, and actors willing to return (and toys to be sold) i see no reason for it. 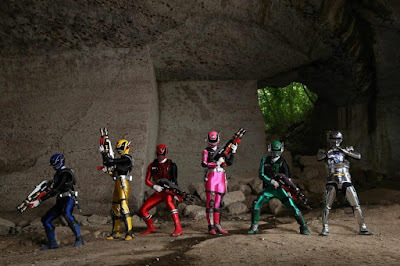 I still would love to see a gokaiger-dekaranger movie considering the space detectives vs space pirates motifs.